This article is not for totally bald people. in this article, I will share some simple tips for the hair regrowth. Protein - if you are not eating a good amount of protein in your daily diet then you can face the hair loss problem, the main cause of hair falling in men/woman are lack of protein in their diet, when you add more protein in your diet it will help to promote thick hairs, and they don't know what to eat to complete their protein requirement, we will tell you what to eat, protein for hairs-egg, chicken, fish, lentils, milk, curd, protein supplements. Omega 3 - you have to add some omega 3 fatty acids in your diet because this nutrient is very helpful for hair regrowth. omega 3 is an essential nutrient for our hairs and body, omega 3 is an unsaturated fatty acid, it helps in preventing your hair loss, you can take fish oil daily it's also a good source of omega 3 fatty acid, it promotes thick hairs, it prevents dandruff from your scalp, it boosts your hair growth, omega 3 contains anti-inflammatory agents in it. omega 3 foods-walnuts, chia seeds, flax seeds, soya bean oil. 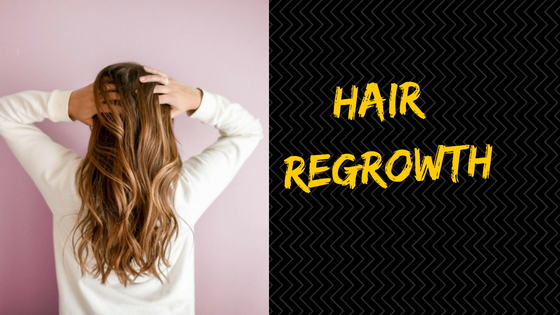 Oils - massage your head with some good quality oils or you can use some natural oils for that because the main reason for massaging your head is that the blood circulation in your head would start and because of this new hairs will regrow theirs. do massage two times a week, you can do at night before bed and leave it for the whole night and wash your hairs in the morning. oils for massage-lavender oil, almond oil, flaxseed oil, coconut oil, rosemary oil. Supplements - you can take ginseng as your supplement and can add in your diet because it has many ingredients which help in regrowth of hairs. you can take one spoon of fenugreek seeds in your diet. (Pro tip - Do not use chemical shampoos to wash your hairs, use only herbal shampoos) you have to eat iron-rich foods because it promotes hair growth in the body. Derma roller - you have to use derma roll on your newly bald area where you want to regrow your hair, this is the best method for hair regrowth, direction for the use- 3 times in a week, use only 5 to 15 minutes only, do that before bedtime, I will definitely recommend this method because I have tried this on my own scalp and this method works there.